Up in the valley in the Premier Men’s match Tupapa showed their dominance in terms of ball possession and tactical play, however they found it difficult to break the deadlock and only managed to score their first goal in the thirty first minute through the boot of striker Campbell Best. Tupapa managed to score two more goals in the first half from Roger Manuel and Paavo Mustonen to bring the score at half to three goals to nil. In the second half Takuvaine showed a lot of resistance and only allowed Tupapa to score one more goal. Late in the game Takuvaine’s veteran and multi talented Vaivase Samania slammed the ball past the Tupapa goal keeper for Takuvaine’s sole goal to bring the final score to four goals to one in favour of Tupapa. 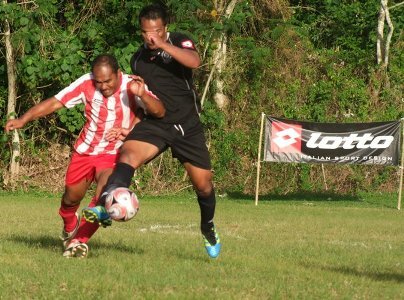 In the other Premier Men’s match Avatiu drew against a revamped Arorangi team, nil all. In the CIPs Image & Copy Centre women’s match Tupapa demolished Takuvaine by ten goals to nil. In the other women’s match at the swamp Avatiu like their Premier Men’s team drew against Arorangi, nil all.